Her hair is wonderful and I like the idea of her sitting in the grass. And I also like the flowers and the grass in the bg. This is a very nice, clean-styled wall. I'm not such a Chobits fan but I like Clamp's character design. Did you make the grass and flowers yourself or are they part of the scan? They fit in very nicely. well done & keep it up! 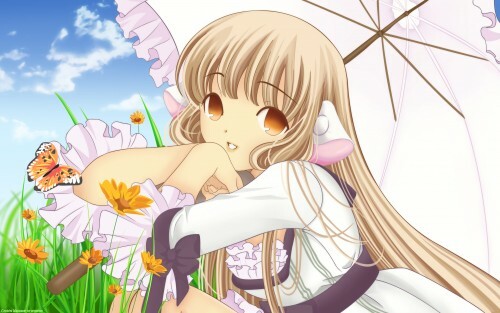 so happy to see a beautiful chobits wallpaper again! Very kawaii! I like it, aneznam-chan! Veeeerrrry charming indeed. Well done. This is absolutely cute! Very summery! thanks for this wall, it is very beautiful!